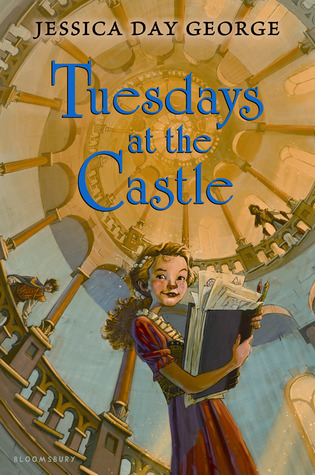 Goodreads summary: "Tuesdays at Castle Glower are Princess Celie's favorite days. That's because on Tuesdays the castle adds a new room, a turret, or sometimes even an entire wing. No one ever knows what the castle will do next, and no one - other than Celie, that is - takes the time to map out the new additions. But when King and Queen Glower are ambushed and their fate is unknown, it's up to Celie, with her secret knowledge of the castle's never-ending twists and turns, to protect their home and save their kingdom." THIS BOOK! Seriously, THIS BOOK! It was so extremely CUTE and awesome! If I had a little sister or cousin or any little girl in my life right now, I would give it to her. You want the little girls you know to read this book. Little boys too, though this feels to me more like something a girl would enjoy. Almost the whole time I was reading this, I had a big smile on my face! It was adorable and funny and I loved how strong Celie and her brother and sister were, faced with everything! I mean, I don't know if I could have done all that if I was supposed to run a castle without my parents suddenly. And the castle, seriously, the castle is AWESOME! I mean, really, living in something that is alive and thinking and adding rooms! And especially changing them so the luxury of your room showed how much it liked you! AMAZING! I LOVED the castle! And I loved that the castle loved Celie and vice versa. And if you have a faded stuffed toy that changed into a real lion? You've got me! I so recognized the being teased about the faded, loved, old toy. And really, I just loved Celie, our main character. She was fabulous and such a caring, intelligent girl. I love smart girls! I had never read a book by Jessica Day George before, but after this, I'll be sure to again. And you should all as well! Thanks for the great review! I've been eyeing this book for a while. It sounds really fun. I like her books too. :) This made me smile. I keep hearing such wonderful things about this book!! I adored this book too! Your review described my reading experience pretty much exactly. I can't wait for more stories in this series! I've loved Jessica Day George's books--looking forward to reading this one!